I liked the advert when I saw this film preview originally, but I did think that it was somewhat less good than I’d been expecting it to be. AI is a concept that’s used quite a lot and I think it raises the question of, if a machine could think, would it be considered human? I thought it was good that Chappie’s development was shown so much – from the fact that he couldn’t talk and how he developed his own personality. He was still very naive in many ways and I really didn’t like Ninja for the way he used him. I did like Yolandi in this film… though not really so much at first. I did like how quickly she adopted Chappie and the fact that, in every way that counted, she was his mother. There were quite a few actors I recognised in this, including Sigourney Weaver and Hugh Jackman. Although I like them both as actors, I would have liked to see a bit more development with their characters. The special effects in this film were cool and it was really entertaining to watch. 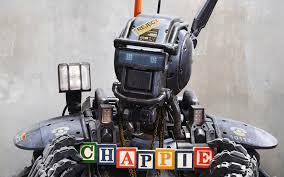 I could empathise with Chappie and the ending was quite an intriguing one. This was a good robot film, but I didn’t like some of the characters the way I probably should have done. The theme of family was good and there were some amusing moments in this… but also some really bad people. A movie I enjoyed. Even if it did sometimes feel like it was just making itself up as it went along. Nice review.